Our whirlwind visit in Marrakesh left our imaginations, memories and cameras full of sensations, stories and pictures. With a visit to the city of Essaouira we were winding down for our journey back home. Like vagabonds we wound our way to a rambling little coastal town with a view of the ocean from our lovely little hotel. We unwound with a walk on the windy beach. Camels and horses were competing for ride business, but we were not too eager for repeat lumps, so we contented ourselves by walking along the village shoreline. Essaouira is a laid-back old port town on the Atlantic Ocean. In the mid 1700s the then installed sultan liked the area and engaged the services of a French architect to create a city there. It is rather off the beaten path and windy, so there are not too many beach goers. 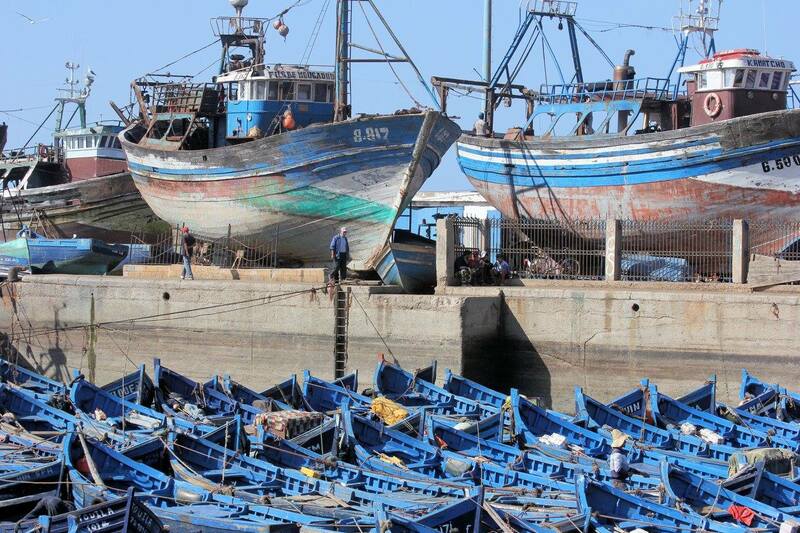 Essaouira remains a fishing village where folks can buy their catch of the day and have it cooked on shore. Or you can buy your fishy meal right at the port food stands. You just pick out what you want and shortly it appears at your table with salad and bread. This little village also supports a vibrant artist community that showcases artisans in every medium. There are not as many outstanding buildings or museums, but charm replaces drama. Dinner was atop our hotel where the specialty of the house that night was a fish medley. We were not disappointed with the fresh array of shell-fish and other sea creatures, all caught that morning. We lingered at table over wine and enjoyed the relaxation, getting ready to complete our journey in the morning. The next day, our van shuffled along the shoreline of Essaouira, with commentary by our tour guide, Addi Ouadderrou, a Malden resident who organizes and leads tours of his native Morocco. Slowly the landscape turned and shifted to brownish-yellow hills covered with olive orchards. Gnarled gray-green trees lined the two-lane road; the land looked parched as if rain was a distant memory. Jolting us from our reverie on the landscape was a shout from Addi. “Hey, stop. What’s this I see, a camel’s head in the window.” Addi had seen something; something that would become profound from this already memorable trip. We pulled into a small parking lot and piled out of our van. In front of us on a tarp, was a heap of several hundred pounds of freshly picked olives that glistened in the sun. 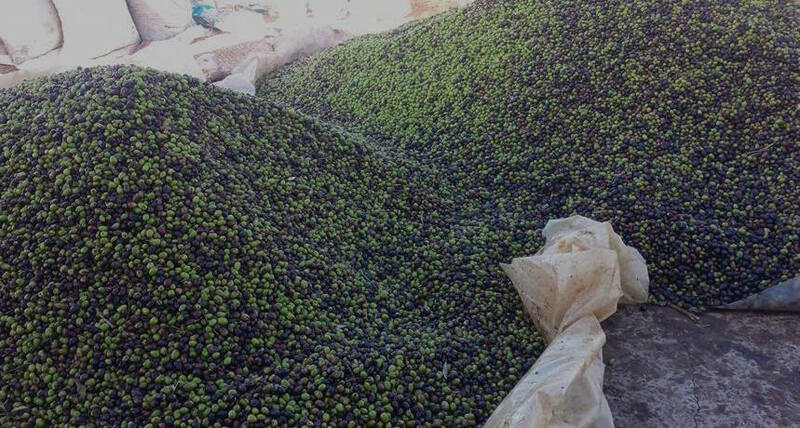 These were olives of several shades of green dropped off by farmers in the area who were part of an olive oil cooperative. A couple of men who operated this little olive oil “factory” walked toward us and we asked if we could watch. As we walked into a 30-foot x 30-foot concrete building, the smells of olives, sweaty men and dromedary instantly hit my nostrils. Olives waiting to be pressed in to oil. Photos by Bonnie Blanchard and fellow traveler Phil Mirvis. Inside the building was a young male dromedary about five years old (dromedaries have only one hump whereas camels have two) and who stood well over 6 feet. His feet were broad and flat, the size of a small manhole cover, with leathery pads and two toes on each foot. This creature was tethered to a couple of concrete grinding stones; when he moved in a circle, the stone mashed the olives into a paste. To prevent eye injury, the dromedary wore cardboard blinders to keep flying pits from striking him. To protect humans from spits and nips, he wore a leather muzzle; he could breathe just fine. As the creature went round and round, buckets of fresh olives were added to the grinding pit, until the mash was the right consistency for pressing. I use tons of olive oil, but I had never seen it made. Now I learned how it was done. The basic steps in making olive oil are always the same, no matter what kind of equipment is used. First the olives are washed and cleaned of debris such as rocks and sand. Then they are crushed to tear the flesh cells and release the oil into a paste for the oil press. 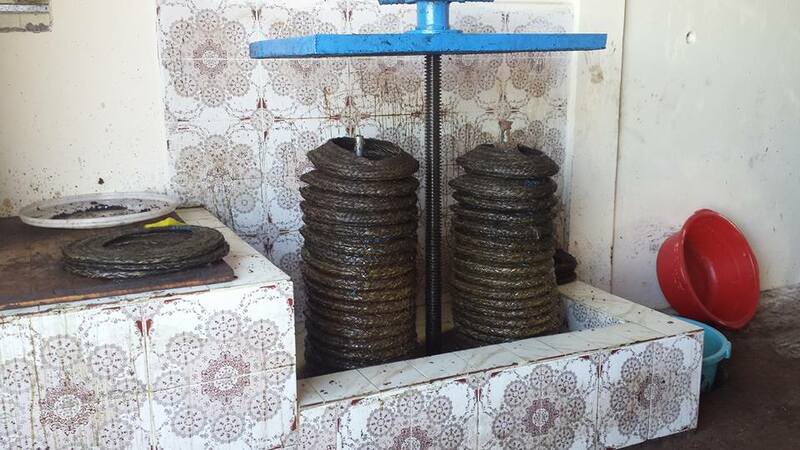 This olive press was by no means anything modern; we watched a process that dates back centuries. This press sat inside a rectangular glazed cement tub about six feet in length. A three foot shelf dropped down 12 inches into a tub that looked to be about 12 inches deep by about three feet wide. This tub contained two two inch metal poles side by side with metal plates at the top and a wheel at the side. This was the press. From this contrivance the pressed paste was scooped from the stone mill into large round baskets with a hole in the middle. These were stacked about 30 high, and the wheel pressed this liquid gold into a bucket at the side of the tub. 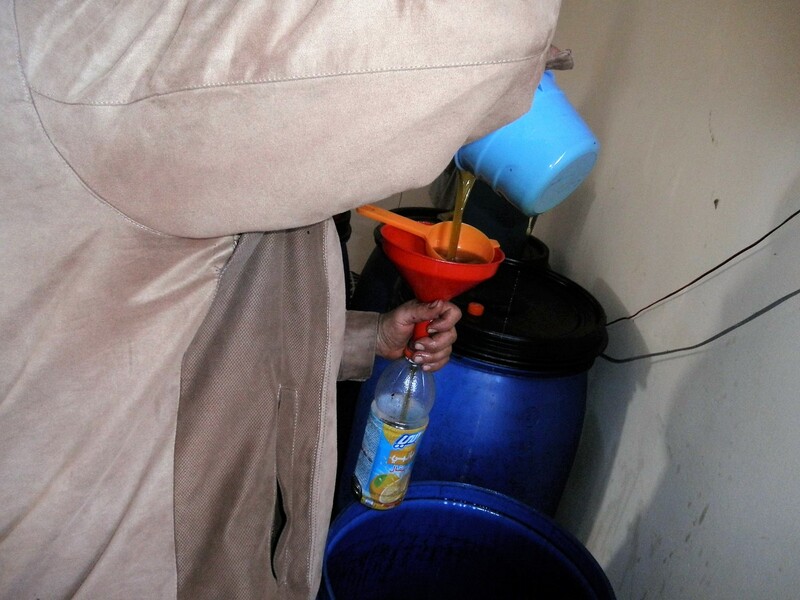 From this bucket, oil was transferred to 2 liter plastic soda bottles and capped, ready for sale. The far right corner of the one room building acted as the supply cabinet, stacked with hundreds of 1 and 2 liter sized soda bottles used for storing and selling the oil. Freshly pressed oil is poured into plastic bottles for sale. 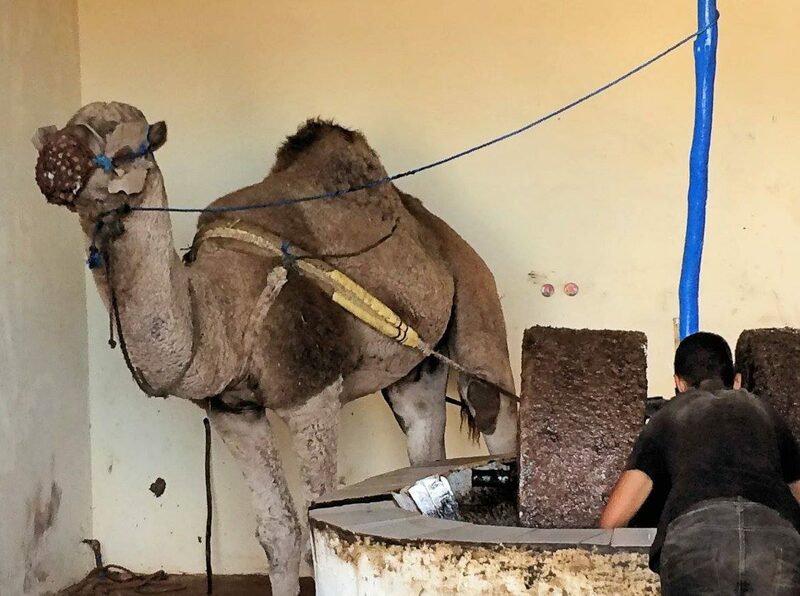 While the olives were being mashed into oil, the young dromedary continued his circular job of grinding fresh green olives, looking at us from time to time. He seemed so happy to be getting attention and pats on his fuzzy soft muzzle with ugly teeth behind his lips. He had a large mouth, with 34 sharp teeth. His front teeth were long and brownish and enable the animal to eat rough thorny bushes without damaging the lining of its mouth, and can be used as biting weapons against predators if need be. As we watched this operation, a man came in with his own bottles to purchase some oil. He had warm fresh bread under his arm. He was startled to see a van full of tourists, but kindly offered us some of his bread, which we learned was called khobz. We broke bread and dipped chunks of this nutty tasting bread into the newly pressed warm oil. Returning to our van for the rest of our journey to Casablanca, we could not help but marvel at what we experienced and shared on this trip. Watching olive oil being made right before us was the perfect stop to end our journey. To learn more about visiting Morocco, contact Addi Ouadderrou, owner of Moroccan Caravan at 285 Washington Street in Somerville. Moroccan Caravan is a showroom and gallery of all Moroccan products. See www.moroccancaravan.com or call 617-833-1503. See parts one, two, three and four. A 23 year resident of Malden, I have been a board member of Malden Arts and Coordinator for 4 of the annual WAM (Window Arts Malden) art shows. 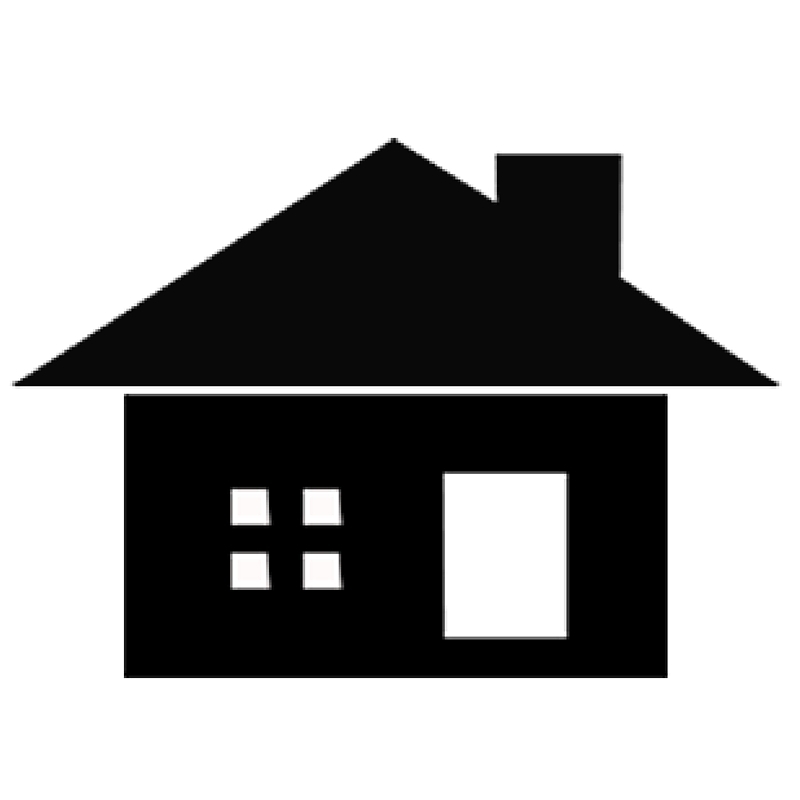 Currently I am a member of Malden's FOOGI (Friends of Oak Grove, Inc). I have a design background, and currently and most comfortably work in mixed-media, having the latest run at creating and fabricating hand made "fascinators"; those wild and crazy hats seen at various high end horse shows around the world. Notable in this country is the Kentucky Derby. 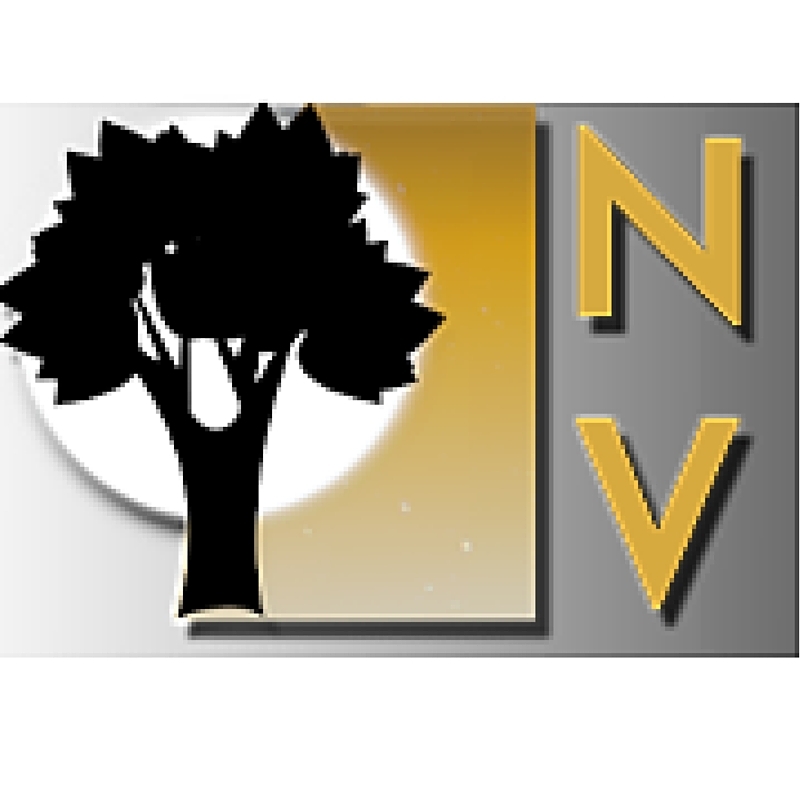 I enjoy being part of MATV's Neighborhoodview.org, a Maldencentric on-line news offering. Wonderful story, Bonnie. I loved “traveling” through Morocco with you.